ADB aka Android Debug Bridge is a software package which mainly developed for Android developer. However, during rooting various devices many time we may require to run few ADB or Fastboot commands. That’s why, we have to set up ADB & Fastboot properly. In this guide we will give you a decent idea on how to setup ADB & Fastboot on Windows system. We will try to add setup instruction for Mac OSX and Linux later. Fastboot command mostly used in devices that comes with Fastboot bootloader. For example Google Nexus devices, HTC devices etc. comes with Fastboot bootloader while ADB command should work on any Android powered devices. Now run SDK Manager.exe file that located within extracted folder. A new window will appear in front of you. 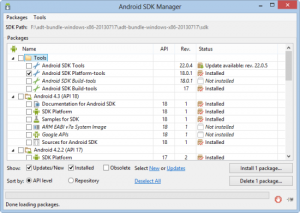 Check Android SDK Platform-tools and uncheck everything. Then click on install packages button. When done close the installation window. Technically you can now run all adb & fastboot command, however only when you are in source folder. However, if you want to run command from anywhere like most other Windows commands then you have to define the command in Windows’ environment variables. Defining it is easy. First open the folder where adb.exe is present and take note of that path. In our case its C:android-sdk-windowsplatform-tools. Now, go to desktop, right click on Computer and select Properties. On the left pane, click on Advanced System Settings. A new window should appear. Select Environment Variables under Advanced tab and select Path variable and then click edit. The semicolon separate it from other values. Confirm and apply all the changes. That’s it! You now have ADB successfully installed and configured on your Windows machine. As fastboot.exe also present in same platform-tools folder, you don’t need to do anything. You should be able to run both adb and fastboot command from any folder in your Windows computer. Please note, you must have Java JDK installed before installing Android SDK. You can download Java JDK from here.